There have been a few stories in the media recently about various companies back up plans being entirely inadequate, the biggest being Marco Marsala. One such company is within the Domain Circle which is HEG which own various companies including Heart, Domain Monster and the company at the centre of the back up fiasco 123-reg. What these companies have in common is that they are some how “I.T. Professionals” in charge of YOUR websites and domains and should know better. This is a perfect example of why I invested quite heavily in my home back up processes, and I used to be a “hosting company” which used to be a Reseller of services by a company called DonHost way way way back. Back then with a 64kb ISDN Line, I used to download nightly back ups of all client sites, and when the back ups started taking over 12 hours, I moved to bi-nightly downloads and so on. This were in addition to the hosting companies daily, weekly making around 31 days worth of back ups (7 days, and 4 weeklys = 11) and the weekly “off site” back up to a non accessible hosting account with another company which had its own back ups too. This non-accessible back up, is technically against lots of hosting companies T&C these days but it weren’t back then. Many hosts include a clause that you can only use a certain percentage of your storage for “storage” that is files not linked publicly by a web page hosted within the account. This is to limit peoples illegal file sharing, but affects legal use too. I think this a croc, if I pay for storage, I don’t expect the company to tell me, I can’t keep legal items in there. Obviously illegal stuff and things which breach rules is one thing, but to say I can’t store private files and then want to double the charge to allow me to store private files is a croc, but that’s another issue. Anyway fast forward 15 or so years, and now I use Synology NAS Units with Hitachi Touro External Hard Drives which perform nightly, weekly functions for local back ups. Many Synology units have a USB port which can be mounted and included in back up scripts, I have a rugged USB Waterproof Pen in there with important files on. The USB drive is stored around 8ft away in a cupboard. Once I can get fibre (NOT cable, I don’t trust Virgin after the Virgin Media cView issues), I will start to use cold storage like Amazons Glacier or similar, but stuck on ADSL the upload speed limits me, but with fibre there is no excuse not to use a service like this. Not ideal or business purposes but Google Drive is 1tb for £60 per year, and Google Photos allow unlimited free hi resolution image storage. These should be used for non sensitive data, always worth using. 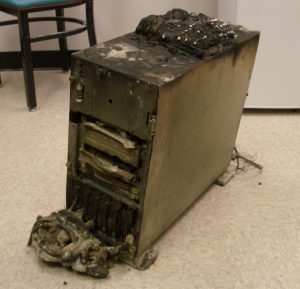 In addition to my own storage, I want to touch on hardware Hitachi, I were around when IBM Death Stars (which went on to become Hitachi Deskstars) were literally melting and vaporising themselves, but now Hitachi Reliability is Legendary. I make a point of buying the same drive from multiple sources or on various different days so they are the same drive but different batches. I were also a little irked when Western Digital took over Hitachi, I feared WD would take over Hitachi’s tech but seems WD bought Hitachi for the technology to improve their own. When you are building your storage needs and requirements, you should research the brands you use. I am a fan of 2tb Samsung F4 Drives, and Hitachi Deskstar’s. I try to replace critical drives every 2 yrs, but I have some Samsung F4s in my media units which have 50,000+ hours of 24/7 running, and some Hitachi’s in similar conditions and they have 0 faults, and clean profiles. Given how much effort I put in both my person and my business it astounds me that companies 10 to 1000s of times bigger than I were can make sure reckless actions. Bottom line is, learn from their mistakes and take steps, losing everything is horrible!